Halloween is celebrated in our house and neighbourhood and the kids have been planning their outfits for the past few weeks. Miss 11 has hit the fashion world so isn’t as keen to get all dressed up without looking her best. Last year to assist with her wishes I made her hair into a spider and she dressed up as a witch. This was a really quick and fun way to get her in the mood for trick or treating. Bend the pipecleaners so they are ready to make as legs. Using your hot glue gun, glue a bun pin onto the back of each eye and the pom pom. Leave to dry and cool. Make the bun using the bands and bun styler. Pop the black pipecleaners in as legs securing with bobby pins if needed. 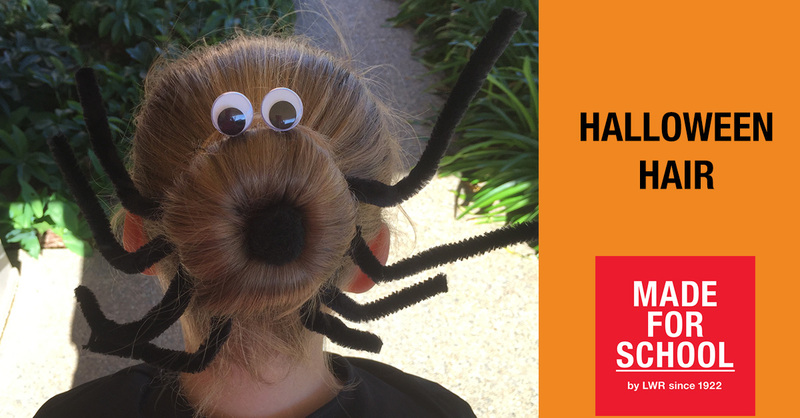 Pop the eyes at the top of the bun and the pom pom in the middle of the bun and you’re set to trick or treat. Have fun getting your craft on with this one.